Your preferred screen resolution is not available in the Display settings? 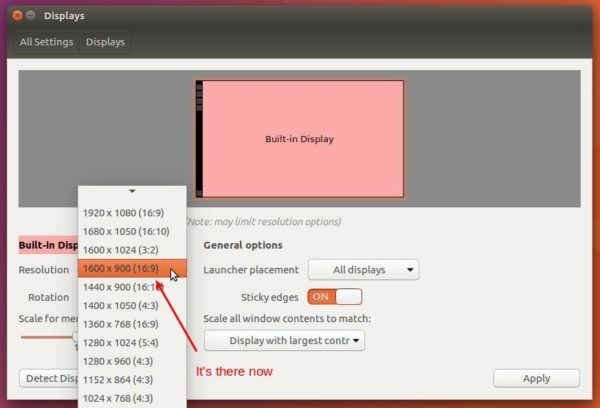 Well, here I’m going to show you how to add a custom screen resolution in Ubuntu 17.04 (Work on all current Ubuntu releases). On my Ubuntu 17.04 Desktop, the default 1920X1080 (16:9) resolution is kinda high for me. Though there are options to scale for menu, title bars, and text, I prefer 1600X900 (16:9) which is available in Ubuntu 16.04 LTS by default. It outputs current screen resolution as well as all available solutions. ALL I need here is the display device name, in my case, it’s eDP-1. 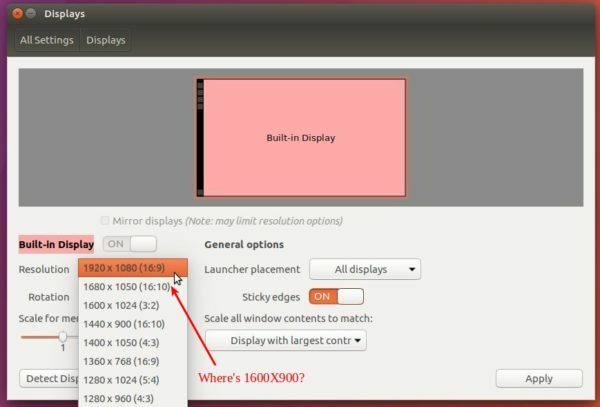 Replace 1600 900 (1600X900 in my case) in the command to your desired screen resolution. NOTE the command section after --newmode are COPIED from previous step output. sudo xrandr --addmode eDP-1 "1600x900_60.00"
Replace eDP-1 (see step1) and "1600x900_60.00" (Step 2 or 3) in the command. add the last 2 commands to the end, commands in step 3 and 4, and save the file. A very cool tip! I now can use a notebook with physical 1280 x 800 resolution with 1638 x 1024 :-) Thank you! I’m getting the following error message. Any chance on helping me make it right? I got that error but if you continue on with the steps it still works fine. I am getting the same error. I don’t know what to do next. Same Here. Does Not Work. your display may be eDP-1 not eDP1. Find the exact text from xrandr (step 1). After changing your screen resolution, it’s xy alignment may overlap or gap your other screens. The steps work fine, but it doesn’t display correctly- I get fuzzy lines as if alignment is off. 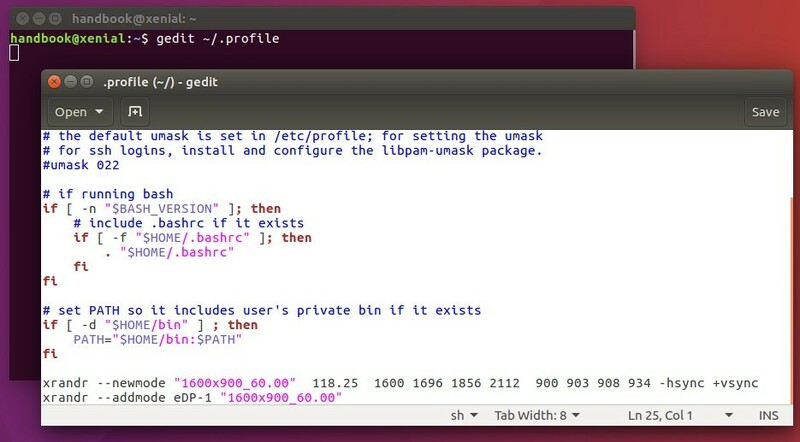 Nice to see this technique laid out neatly – you don’t need to place the “cvt” command in your profile file though. That is only used to give you the format for placing in the –newmode xrandr command. Not sure what’s the problem. But as @Andrew said, it still work if you continue on the steps. Thanks a lot Ji !!! Does not work at all. Xrander not found. Whye the HELL do you have to do these things in some little DOS box in Linux? Can’t they catch up with other operating systems where you do not have to use this little MS DOS box, and set things in a GUI? And it should be forgiving of your spelling and or typing. I typed Xrander and it gave an error! Unbelievable. It should work spelled either way. Then, the thing does not say anything about edp-1 so that does not work. I don’t know what else would??? I got this…..
Modeline “1600x900_60.00” 118.25 1600 1696 1856 2112 900 903 908 934 -hsync +vsync…..
THEN you notice, “command not found 1600! WHAT THE HELL??? Why would you have to put in ANOTHER command? OK so then the cvt thing. …. thern to top it all off I finally get this. …. xrandr: cannot find output “eDP-1″…. AND it simply does not work. Can’t someone write a damn display thingy that you can click on the numbers you want, picking displays from a list (mine is a Dell UltraScan P1110 – CRT monitor – 21″… which last I checked Window XP had listed, and I used.) Nothing showing up, you cannot select anything from the dropdown. AND I REFUSE to get a new monitor, this one is much better than those flat screen crap ones they now sell with the stupid widescreen, which I never saw the need for! Also it’s native resolution is 1800X1440, which I can’t seem to find in the dropdown. It only wants to let me set some widescreen thing , 1024X768 OR the old fashioned 800X600 which Windows 95 used. I think Linux is about 20 years behind the times on this one. OK after typing stuff in for like 2 hours, trying over and over and all kind of errors and stuff, it finally worked. Why does it have to be so hard? THEN I went to do the final steps with gedit and it is not installed! I guessed I could do the same with mousepad (since I’m on Xubuntu_) and I hope I got that right. mode is now 1280×1024 and for some reason it won’t run at 75 htz like the monitor manual says, it gets all wonky, so 60 htz it is. Oh and thank God for the old monitors buttons that set size and top to bottom height, etc. That was way too hard to figure out how to do with some obscure DOS code in a little box, I prefer physical buttons!!! Now to find where the color profiles are stored! OH WAIT I can set colors right on the monitor with BUTTONS unlike these new flat screen things where you can’t adjust anything at all without being some sort of genius programmer. Hell, can’t even find the “on” button on most of them, it’s on the back or side or something, I like it RIGHT on the FRONT labeled “ON” where you can see it!!! VGA-0 instead of the edp-1 was one mistake apparently. It seems that you can’t use xrandr with the nVidia proprietary driver. Getting back to the driver included in Ubuntu fixed the error for me. Moreover, my screen did not show proper resolution, and seems that you can not always depend on cvt and gtf. I got the working numbers by finding your device EDID and reading it by parse-edid. How can I do this… Increase my resolution by , ” (6) 1080p monitors”.? Don’t even try. Not gonna change anything. You are gonna get nothing but error messages. This step-by-step much appreciated and worked for me. In the step xrandr –newmode … I received some errors, but per comments here I just ignored them and continued on with the steps. Could you explain why that resolution wasn’t there initially? For me just one 16:9 resolution was there, ie 1920×1080.. all others were in 4:3.. I spend 2 days trying to solve this problem. Video adapter nvidia gtx 760. Using VGA cable with DVI converter . So where you used eDP-1, I used DVI-I-1. It worked perfectly applying 2560x1440x44Hz in my display. And when I restart, it keeps this resolution. Worked like a charm for my LG 22M45HQ-B which refused to be set in native resolution of 1920 x 1080. Great job, clear instructions. Thank you! Best article I found on setting resolution manually. Folks, you need to follow each step and the red highlights on the picture are there for a reason. This is a Wayland issue since it’s default in Ubuntu 17.10. Try the update in Step 3.